Chicago Blackhawks goaltender Corey Crawford is nearing a return from injured reserve, according to head coach Joel Quenneville. Crawford, who was placed on I.R. on Friday with a lower body injury, has missed the team’s last two games, and is expected to miss at least two more with the team visiting the Washington Capitals on Wednesday night and taking on the Buffalo Sabres at home on Friday. According to Quenneville, Crawford has been skating in Chicago, and his expected return date could come as early as Sunday night, when the Blackhawks welcome the lowly Arizona Coyotes to the United Center. 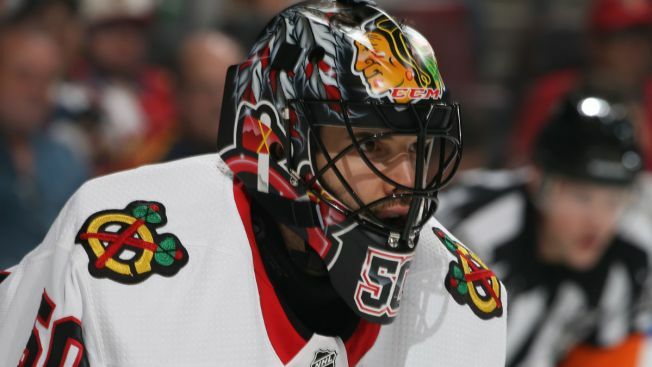 The netminder has been dealing with a lower body injury over the past several weeks, according to Quenneville, and the team decided to let him take time off to heal the ailment this week. Anton Forsberg has been called upon to start in Crawford’s place, and he has allowed just three goals in two games thus far. Crawford has appeared in 21 games this season, surrendering a 2.29 goals against average and an 11-7-2 record in those games.